This is a guest post by Dr Andrew Lilico. The Archbishop of Canterbury believes that in attacking the gig economy he is standing up for the oppressed against the oppressors. In his speech to the TUC he quoted Mary’s famous song, the Magnificat, where she spoke of scattering the proud, bringing down the powerful, lifting up the lowly and filling the hungry. He talked of John McDonnell’s reference to the old system on the docks in the 1930s, where workers lined up to be chosen. He declared the gig economy “the reincarnation of an ancient evil”. He’s entitled to say these things. Indeed, as an archbishop he’s obliged to offer biblical insight and Christian reasoning to the problems of the world. But in this case he’s both mistaken and missing a key contribution that biblical insight and the social outreach of the Church could offer. Christianity teaches that it is wrong for businesses to seek special privileges and vested power (sometimes granted to them by the state; sometimes through monopoly) which they then use to exploit workers. But it is completely wrong to suggest that the gig economy is the exploitation of workers, let alone, as John McDonnell suggested and Justin Welby endorsed, a return to the 1930s. In historic situations of worker vulnerability, firms had power and workers almost none. Large firms were often the only significant local employer. Workers with limited transport opportunities, limited information and no way to support themselves whilst they searched for work away from their homes had to work locally. If they did not work for the large local employer, they did not work at all. This became particularly acute in periods of high unemployment, such as the early 1930s, when UK unemployment was above 20 per cent. In some areas unemployment rates were above 50 per cent. Firms had all the power. If they did not have the protection of a trades union, or personal contact, or a benevolent philanthropically-minded employer, workers had none. In such a setting, there would be an excellent role for an archbishop to urge business owners to act philanthropically, helping their workers out, not simply getting the most work from them for the least pay they would accept. But the modern gig economy is not like this at all. Unemployment is 4 per cent, not 20 per cent. Those seeking work can search via the internet from their own homes – and they do. They can find permanent, part-time or contracting positions in their local area, in another part of the country, or even in another country altogether – and they do. People do not offer services in the gig economy because they have no other choice. They have enormous choice, with bargaining power and options vastly beyond the imagination of any 1930s dock-worker. Earlier this year, the UK government published a major survey it had done of those operating in the gig economy, asking why they offered their services in that way. This found that the main reason people offer services in the gig economy was flexibility, specifically: individuals caring for family; students who needed flexibility alongside their studies; and individuals who had a preference for greater control over how their time was spent. People work in the gig economy whilst they pursue their dream job, to build up experience for later full-time roles, or to supplement their incomes from other work. Over 90 per cent of those operating in the gig economy identify themselves as self-employed. Gig economy workers are not oppressed and they do not need the Archbishop to save them. A more useful role would be to highlight and mitigate the new forms of social exclusion that the gig economy and other sharing economy activities could create. Scoring and rating systems can be vulnerable to prejudice (eg race) and malicious attack (eg being targeted for your political opinions), or simple errors. And if people have a bad period, their ratings could fall so low that they cannot subsequently secure gigs at all, to prove they had changed. This is a genuine policy concern and a concern for Christians (just as there is a genuine policy concern regarding the risk of social exclusion for those whose credit ratings become too low). The Church could encourage people to be forgiving of gig economy suppliers with exclusionary ratings, and give them another chance. The Church itself could offer platforms where reputations could be rebuilt (akin to firms that currently offer credit rating rebuilding services). These are the vulnerable, broken people that the Archbishop should concern himself with, instead of lobbying to prevent a working mother from securing a flexible cleaning gig. 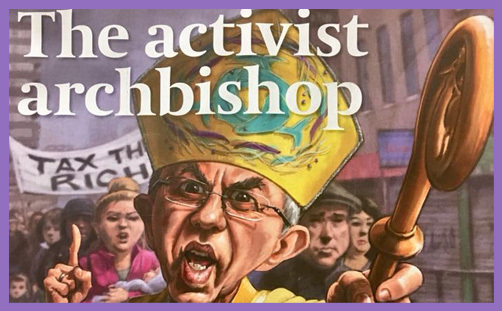 The Archbishop attacking the modern world, placing modern practices crudely in the obsolete boxes of the past, and imagining that wherever there is an issue there must be a law to forbid it or a tax to correct it, is dreadfully naïve. Christians should engage with political debate. But we should understand the matters we pronounce upon correctly, and find the right people to stand up for. Otherwise we just become political pawns, as the Archbishop, sadly, has appeared in recent days.